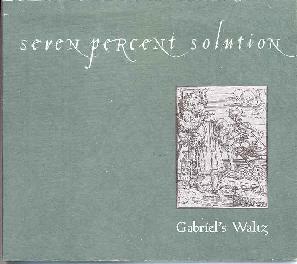 Seven Percent Solution - "Gabriel's Waltz"
The new release from Texas-based Seven Percent Solution offers up more of the bands' beautifully mind expanding psychedelia and is a magnificent follow up to their debut CD "All About Satellites And Spaceships". The band consists of Reese Beeman on guitar, bass, and vocals, James Adkisson on guitar, Scott Sasser on drums, and Julian Capps on guitar and bass (apparently having replaced Dwayn Moore). Seven Percent Solution plays dreamy guitar-driven psychedelia with soft lullaby vocals. The guitars work together to create some of the most beautiful psych I've heard in a while. This is floating trippy music rather than being acid psych. The guitarists do such an admirable and creative job of developing their sounds that it's hard to believe no keyboards or synths are used. While listening to the song "The Innocentes" I jotted down a note asking "are there really no keys? ", and the band later confirmed that the music is all guitars with this track being the exception from both CD's (an omnichord was used on this track). The band creates an atmosphere that one could get lost in right from the opening track ("Dear Anne") with one guitar strumming softly while the other creates a synth-like choral background. "Threshold" is a similar song that really displays the bands ability to create both atmosphere and melody. Despite the nature of the music most of the song's aren't very long, though the band clearly makes their statement in the timeframes used. Still, I'd love to hear what would result if they cut loose and let it rip for about fifteen minutes or so. Highly recommended. You can visit Seven Percent Solution at their web site. Available through Lone Starfighter Records.